The World’s largest economy will still be nearly 80% fossil fueled in 2050. On the road, most people are still using gasoline cars, and here’s the kicker — electricity prices are still at about 11 cents per kilowatt hour. Weep all ye Australians, Brits, Germans and other who would be grateful if electricity only rose 10% a year, not 10% over 30 years. How much does an interconnector cost from Townsville to Texas? Despite all of the hype, hope, cheerleading, fuel standards, portfolio standards, and taxpayer subsidies for renewable energies like wind and solar, America’s energy future will still rely primarily on fossil fuels to power our vehicles, heat and light our homes, and fuel the US economy. EIA, 2018, Graph, Total energy use projections. EIA, 2018, Graph, Electricity Prices, projections. Of the renewables, only solar PV is forecast to increase. Wind stays the same; Hydro stays the same; Geothermal is still tiny. Big-solar does not even rate a mention. Renewables, a small non-essential part that isn’t going to change much. Industrial energy use will be … about the same mix. Not the car transition some are expecting. The sad thing about this is the number of voters in SA who actually believe the garbage that Weatherdill and his mate spruik. The Lib opposition is apparently not much better. So I believe he will get back in. How much is this Gerbil Warming going to cost us before the politicians come to their senses? Sth Aust is totally reliant on energy from Victoria when the sun don’t shine and the wind don’t blow. The fact that a huge proportion of the voters in SA don’t realise this is amazing. They truly believe that renewables are paving the way to utopia. If there is any Liebor voting Gerbil Warming warriors reading this, please note that I have a slightly used bridge for sale. Yes, the real cost of renewables is not the wholesale price but should included the Large scale Generation Certificate they are given, and which the retailers have to buy (Currently about $85) and lump it on everyone’s bills. So the real cost of renewables is a minimum of $185 not $100 (or the summer rate over $116). In context we used to get electricity at around $45 when SA had coal fired power, so renewables are 4 times that of conventional generation. Still the rule in politics is to tell a big lie, and repeat it often. Jay Weatherdill and the general phenomena of kaput State LNP who still can’t win orifice, are but a symptom of the deeper problem, an electorate full of people who will still vote for this corrupt political deadwood regardless of how bad they are, or which side they’re from. But I still have my cheezey-poofs (Twisties) and scorched peanuts … soooOOoooo … all’s good. I heard an interview with a spokesman for a new project based on a solar farm and battery system to be located near Kalgoorlie WA to service the local grid area which apparently suffers from unreliable electricity supply. The cost of bringing another power line from the west, he said, would be a hundred million dollars or more as compared to the proposed stabilising solar and battery system for several million dollars. What he said made sense, he was not presenting it as a replacement for the existing electricity grid in WA. However, during the conversation he mentioned SA and that about 10 per cent of electricity comes from so called renewables, and the ABC radio programme presenter mention Minister Friedenberg and that he had been interviewed some time ago and said that SA obtains 10 per cent from renewables and 1 per cent from the stabilising battery system when required. The SA Labor Government talks about obtaining 40 per cent from renewables, obviously quoting nameplate capacity to impress poorly informed voters. There is a better chance for the defeat of the Weatherdill Labor Government of SA at the next state election because of the electoral boundary changes imposed by the Electoral Commission. The result removes the substantial advantage (gerrymander) that made the task of defeating Labor in SA almost impossible. The government challenged the boundary changes at the High Court of Australia last year and lost. Wal 1957..your comment that S.A. totally relies on Vic for its energy …should really be VIA Victoria for energy.. Here tonight watching the “Live supply and demand” Nemwatch……. NSW is pumping Electricity into Victoria ( who is only JUST generating enough electricity for its own use)this is then being sent via the connector into S.A….approx 500Mw. From what I can observe S.A appears to be approx 400-500 Mw short of energy, on a regular basis.. The above figure is what was generated for the 6 states. The Energy Companies are making a “killing” selling spot price electricity..when the sun and wind farms “dive” or “go to bed for the night”….NO wonder we are paying through the nose for electricity.! Hydro isn’t shown as increasing, possibly because it is so cheap and reliable that the obvious sites have been utilised. Unlike in China. Wind has drawbacks and depite endless claims that it is/will be cheaper than conventional generation its day has gone. Once Govt. stop subsidies people will stop building wind farms. Too costly to run, and would become enormously expensive if they were required to provide steady production. No battery is ever going to make them dispatchable within 30 years and I would think even longer than that. The lack of interest shown in tidal energy would seem to indicate that engineers are starting to be heard instead of renewables obsessives. On the bright side, maybe this trend will get to Australia sooner than later. As I understand it, the main reason that China is still going strong on solar panels is just to support their own manufacturers. Unfortunately, the installation of more hydro is politically impossible at this time. We have had to battle the environmentalists to keep them from tearing out the existing hydro. 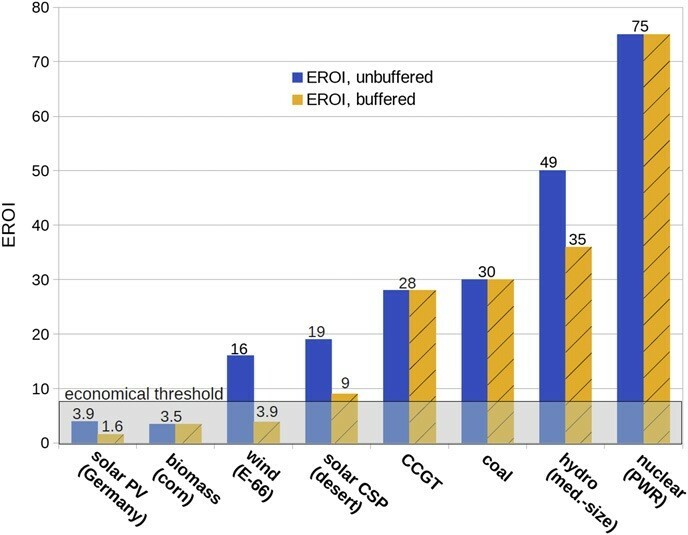 In the long-term of the non-hydro ‘renewables’ solar PV + storage is the least economically viable of the wretched lot (Weißbach 2013). So Big Wind is just that? Just that, a wealth creation scheme for crony capitalists assisted by compliant governments and friends in governments. The moral tragedy of our time is $1,500,000,000,000 a year on ‘renewables’ and we could have had fusion energy. No CO2. No pollution. Infinite power. For less. Yeah, you greenies (the Reds), put that in your pipe and smoke it!!!! They will only claim that the numbers and charts have been fudged to give the totally wrong impression. They should know a fudge when they see one, they have had considerable practice, over they years. In this way, nobody knows what the truth is, other than what they choose to believe. It is the death of science folks, and the resurgence of magic, as a primeval force. There are more nerds and geeks than there are greenie slimes. Science will prevail! And alterative-lunacy greenie girls have hairy under arms, hairy legs, and … well, you get the point … no one likes that … plus they spruik all that Maltusian population-bomb poo … soooOOoooo …. we can just out-breed them. Plus, in 10 years their gel-cel and Li battery banks will all be stuffed, and the freebie spigot plugged, so it really may seem like the Malthusian end of the line for them. These doom things always go in 10 year steps. Such predictions are a waste of time (full of wind if one cares to use a pun). All we can say with much confidence is coal, oil and natural gas will be the biggest sources of energy for some time to come. Changes to new technologies take a long time. The renewable supporters can jump up and down all they like; much like a whining baby but that won’t change matters. In fact hundreds of coal fired power plants are still being built all over the world with hundreds more planned – except here in Australia of course where we are just being childish and immature. That’s OK – even a screaming child has to grow up one day and learn how to stop whining and become more mature. First though we will get a big spanking just to stop the whining. The lesson will come shortly afterwards. Some smarter countries might soon start to follow the lead of Japan and China and start building new generation coal plants. Images like these infuriate renewable power supporters, and here, when I say renewables, I’m only referring to wind and solar power, because they always seem to leave out Hydro. I’ve found a little quirk with the great unwashed renewable power supporters. They cannot distinguish between electrical power generation and Energy. Occasionally, I’ve been to other sites and quoted that renewable ….. ENERGY only accounts for just a little less than one percent of total ENERGY consumption. The furious (quite literally) responses quote all sorts of figures giving wind power at 6% to even 10% Plus, and Solar up to 5% and even more. They cannot differentiate between energy and electrical power generation, even after I point it out to them. Just try to explain that they do no more work holding a 100 lb bag of flour on their shoulder than a fence post would do holding it. They won’t get it because they expend energy just standing there and the post doesn’t. “But…but isn’t that work?” No, it is simply the difference between a dynamic post and a static one. There is force against the bag but it doesn’t move anything. Thus no work. If they can’t understand basic elementary school physics, how are they going to understand the difference between energy and electricity? I suspect jungle savages understand more about such things than they do. At least in a qualitative sense. PS: In spite of the encouraging DOE report, I seriously doubt that we in the US are going to run out of stupidity any time soon. However, it is good to see that a major generator of stupidity has turned it down a few notches. That moves us a bit closer to MAGA. I voted for Trump on the outside chance that he was for real. It was a good choice. Even if the only outcome is that the green blob, the deep state, and the psychotic MSM have gone totally bonkers because he won. It proves that it is possible for one man to make a difference. I just hope that, “… the green blob, the deep state, and the psychotic MSM …”, are being clearly identified. Some of us are going to have to drain the swamp, and it would be useful if we could identify and deal with the discards, before they start getting in the way. Tony you have to understand that explaining such facts to a renewables “expert” is like trying to explain Einstein’s field equations in his Theory of General Relativity to a kindergarten kid. I think I understand Einstein’s Theory of Relativity. All your problems are relatives. One must be careful about EIA (Energy Information Administration) and IEA (International Energy Agency) various claims and charts, because they have unique interpretations and beliefs regarding various energy supplies and uses. Especially for energy systems without official tracking or measurements; basically allowing EIA and IEA to invent whatever numbers they need. 1) EIA and IEA use different definitions for what appears to be the same energy sources. “Other Renewables” as used by the EIA includes a substantial amount of “energy” estimated for various home installed solar systems. Given that the majority of home installed solar systems are hot water systems for replacing/supplementing a home’s hot water supply. EIA estimates home solar hot water BTUs. A) Home installed solar is treated as installed and operating forever. B) Energy projections for home solar are deducted from other projected energy sources; e.g. hydro, fossil, nuclear. • 4) Never worry about solar arrays end of life removals. • 5) Ignores rain, snow storms, dust storms, cloudy weather, etc. All of which goes a long way toward explaining why the “Other Renewables” graph line spike upward at an astonishing rate starting next year. Hopefully, Trump will get the EIA sorted out and reporting closer to reality soon. I think it’s a big assumption that the promoters for solar and wind can keep up their sham for another 30 years. At some point the bottom is going to fall out of the solar and wind renewable market as those buying energy at an ever increasing cost are going to want to know why and refuse (finally) to believe the tripe they are fed. Once the world realises that the atmosphere actually needs MORE CO2, not less, we would probably see the coal industry expanding again. They should actually BE PAID for supplying CO2 for the world’s agriculture. I think the bottom of the Western economies will fall out first before that happens. Then other nations, like China will be in a relatively much better shape because they have refused to go full steam ahead with the AGW scam, and instead have built and keep building more and more coal and nuclear power plants. More often than not we have to learn our lesson the hard way. It’s a shame but much of the blame rests on our education system that keeps pushing their Marxist-Leninist propaganda and churning out immature non-thinking drongos that believe in too many false ideologies and worldviews. China is world leader in the export of renewables and fully intend to flog them along the new silk road. Diesel Powered Generators. Power You Can Rely On. Get your home diesel power generator now. Now the cheapest and most reliable home supply electricity in Australia. Don’t put up with power outages and power costs thru the roof. Extra CO2 a bonus! Come to think of it if I was going to build a new house I would forget all the renewables nonsense and put in place a large diesel generator in a special soundproofed room. I rather spend say $20,000 on that rather than on solar panels and batteries. Sort of reminds me of the very old movie The Omega Man. I can’t think you’d need to spend so much. Here in the US, you can get a whole-house generator that will pump out 22kW on propane or natural gas (19.5kW) for about US$4,800. That includes the automatic transfer switch. That could easily power central air here, and we’re not exactly parsimonious when it comes to energy consumption. A similar diesel product would be about US$12,000. I don’t know what the delta is between diesel and NG/propane as a fuel so you’d have to do your own LCO calculation. Plus acid rain through nitrous oxides with the very high compression. Let’s have real pollution with diesel, not CO2 which is utterly natural and essential for life. Google gave up doing no evil a long time ago. I have avoided knowingly using ANYTHING Google for many years. So far so good. Some friends of ours run a commercial website for a small winery, and their site got flagged by Google as a dangerous site which lost them business and created image harm with the big red warning page that pops up. The process was long (months) and tedious to get it back to operation and they never found out the root cause. Why do they stick to stoneage units? Quadrillion btus… 1Wh is 3.4 BTU. Keeping everything in the same unit, and preferably modern ones, makes it easy to compare. The greenies love this fiddling with different units, as most of the population is at a total loss to figure out this by themselves. Makes it real easy to keep convincing people that renewables are moving fast upscale. Can anyone tell me why Nymex natural gas price is so low at the moment? What price are you seeing? The current price is $2.75 per million BTU’s which is only $0.25 less than January when it was very cold. February has been normal to warm along the east coast where a lot of the population lives. West coast has been warm all winter and the only cold is in the upper mid-west and around the Great Lakes. I suspect if the price is low it may simply be a response to low demand. I am looking at Bloomberg Commodities. Current price is $2.56 which is a 2 year low, which is why I asked the question. Slowly, slowly western nations have continued to tie all of there requirements to electric and electronic devices and equipment. Can anyone else see the problem with this? I feel that if they were around, Richard Carrington and Richard Hodgson would have seen a possible error in this move. Might need a bit of future proofing. Trouble is we can’t even elect governments that will do the obvious, like build dams and effective electricity generation. If this type of event occurs it will be very interesting. The future will be a lot like the past. DUH. But hey, I’ve got an idea for those wind farmers left behind. pass legislation to this effect…it might even be an improvement to the drivel they usually deal with. The market has evolved a lot of uses for solar, where an efficient device, a cell, and a battery have eliminated the need to lay cable. multifuel to take advantage of conditions. Can’t seem to make those windmills pay. Not sure ethanol is really a positive, but the market has integrated it fairly well and most small engines can now tolerate the stuff. Wind still doesn’t fit. So what do the pols keep flogging? The politicians keep flogging wind subsidies because it makes them feel good in their own worldview. It has nothing to do with reality. Meanwhile, electricity companies like AGL are making big profits thanks to government policies destroying coal power and encouraging them to produce more and more renewable instead to increase their profits even more. All this while the consumer pays more and more. It will be telling as to how long voters keep supporting this strategy by keep giving one of the two major parties a majority vote for government. Stupid is as stupid does. The longer it goes the more stupid Australians will look to the rest of the world where they are building massive amounts of new coal fired power plants in spite of the AGW worldview. I have been trying to think of uses for old windfarm sites. What needs 40 tonnes of concrete and reo foundations? new cellphones towers, country condominiums, airship moorings? Somewhere for Barnaby Joyce to hide out? No production bottlenecks for them then? Jo, something doesn’t add up with the EIA numbers compared to the IEA. E.g. Here’s the latest pie graph from the IEA ( EU) for the US TOTAL energy by source in 2015. NOTE Geo + S&W only adds up to 1.4% of total energy. Lomborg says the IEA claims that in 2015 S&W alone generates less than 1% of TOTAL world energy and will only generate about 2.5% by 2040. Here’s the US IEA pie graph for 2015.
http://www.iea.org/stats/WebGraphs/USA4.pdf NOTE only about 17% is generated by coal. For comparison China generates 66.7% from coal and only 1.6% from Geo +S&W. Unbelievable but true, yet the US gets belted for reducing emissions and China’s extreme use of coal is ignored. Big Solsr uses enormous real estate for a tiny is it c.150MW nameplate, while one coal turbine is typically 600MW. One person familiar with the negotiating process, who spoke on the condition of anonymity to freely describe what the person had learned, said that the budget request had been lowered after negotiations with the Office of Management and Budget, and may have been lowered further because of a desire to channel more funding toward nuclear energy, a favored subject for Energy Secretary Rick Perry. And the EU is getting scared. It would require the ignorance and naivete of a true climate change believer to think this threat has anything to do with anything but the fact they see economic damage coming if they remain on their course in light of the direction the US is going. President Trump and his objectives threaten to force change upon a lot more than the leftists in the US. opinions is that the Commonwealth signs up to international agreements, but the States control the methods of production and transmission by either the private suppliers or (in WA) their own system. Most, mostly Labor, seem in a race to prove they are ‘greener’ than each other, in the fight to hold their own voters or gain from the greens, or the Commonwealth. Hence they are all out to out-do even the Paris Accord. In the end it appears no one body speaks for anything but its self and in accord with its own electoral self-interest. The hardest part of all this Climate Change / Global Warming stuff is to understand why most governments of the Democracies are so exclusively ‘true believers’ in a ‘science’ that runs like a Dark Ages religion with all the connotations such a belief brings. Indeed the vigour with which they pursue all this is almost with the fervour that ISIS enforces radical islam. Doing harm to the populace and getting fleeced of coin to be sent somewhere overseas, even as the nations themselves are almost broke, seems not to even raise a brow of concern. Even in the face of falling public confidence in what is happening cannot change the belief of politicians. Why? This is unheard of as formerly, public support was the bread and butter of politics. Is it fear of a coming retribution which can only be forestalled by those currently in power by constituting laws that simply protect themselves? If so, we should only expect increasingly censorious and draconian laws to force ‘sceptics’ to shutup, almost like the Universities are handling Peter Ridd and anyone else that, like heretics, don’t and cannot do as they are told due to the scientific results that underpin their consciences. Four degrees would mean unmitigated disaster for human societies and global ecosystems. We cannot let Santos proceed down this path. Together, last year, we forced Santos to admit to its disastrously inadequate climate ‘plan’. This year’s resolution, backed with greater investor lobbying, could force Santos to adopt better climate disclosure in line with two degrees of warming. This year, resolutions may also be passed that force gas companies to measure fugitive methane emissions or QBE to disclose how its support for the coal industry is compatible with a safe climate. These steps are essential for the corporate sector to align with our carbon constrained future. The EIA doesn’t think there will be a carbon constrained future. Maybe the Wilderness Society has taken Ghandi’s advice: become the carbon constraint you want to see in the world.